This earth to wood contact (ok so it is pressure treated but normally these are 4x4 Here on the west cost these would only last about 5 years. Most of the decks are small (depressed area, low income housing and such). Most have low decks. The recommendation for blocks with tie downs and attachments mechanism. I would be calling out almost 2/3eds of the decks on all inspections? 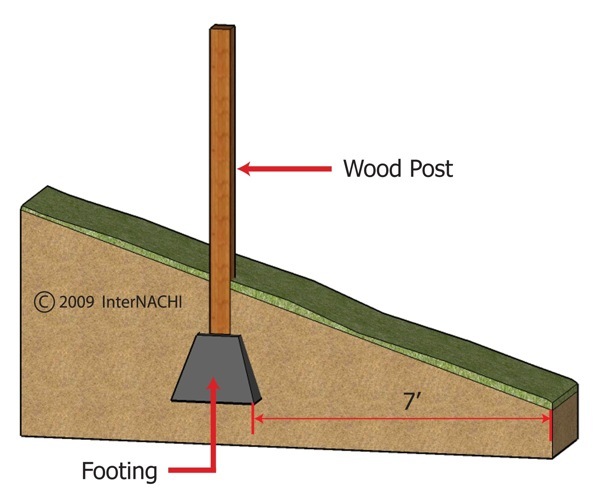 Most decks are built with 4x4 upright post which are approved by the state building inspector? The course state 6x6. I will have to check with the building departments to find out the regs on how tall the 4x4 can be. Every area will be different. Imagine what they need in Florida. Talk to your local AHJ to find out what is required in your area. In the category From the ground up, under heading Footers and Posts, is this statement below, I am not sure I am reading it right... Is it saying you may NOT put a footer in undisturbed soil??? The image above depicts a free-standing deck (not attached to the home or building). The footing near the home may not be placed on undisturbed soil. Some codes consider soil to be "undisturbed" if it hasn't been disturbed in more than five years. Because of its location, a footing near the home may likely be resting on disturbed soil. The image above depicts a free-standing deck (not attached to the home or building). The footing near the home may not be placed on undisturbed soil. Some codes consider soil to be "undisturbed" if it hasn't been disturbed in more than five years. The inspector may discover that, because of its location, a footing near the home was not placed on undisturbed soil, which may result in incremental failure of the deck's support, as the footing is likely to sink lower and lower into the poorly bearing soil. Let us know if you have any further questions, and thanks for bringing this to our attention! The image above depicts a free-standing deck (not attached to the home or building). The footing near the home should not be placed in disturbed soil. Disturbed soils are those which have been altered as a result of grading or construction, etc., giving the soil variable characteristics. Some codes consider soil to be "undisturbed" if it hasn't been disturbed in more than five years. The inspector may discover that, because of its location, a footing near the home was not properly placed in undisturbed soil. A footing placed in undisturbed soil is desirable because that soil is more compacted and solid. Placing a footing in disturbed soil is less stable and may result in incremental failure of the deck's support, as the footing is likely to sink lower and lower into the poorly bearing soil. Hope that clears up any lingering confusion! Time to do Deck Inspections, was going to do HVAC, that will be next. Getting started on this Deck Inspection course! 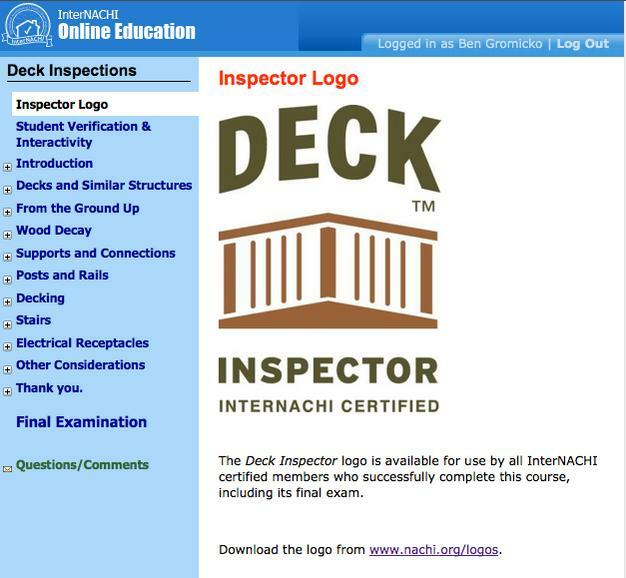 The *Deck Inspector *logo is available for use by all InterNACHI certified members who successfully complete this course, including its final exam. good course, I enjoyed it. In the course it talks about how the ledger board is supposed to be directly attached to the band joist and how you shouldn't attach the ledger board over siding as it will make for a weak connection. I was searching the internet and came across this product called Stratton brackets where you literally drill through the vinyl siding and into the band joist and attached these brackets to the house where the ledger board can then be lowered onto the brackets. I was just curious if anyone has seen these before, if they are considered an ok method of attachment for a ledger board and if it is commonly seen in the field?